When I opened my refrigerator the other day, I saw rice, rice and more rice. It's easy to make rice. It's even easier when Medha makes it. And also staring at me was the rotisserie chicken, begging to be eaten. But we'd eaten it with salad, in salad, sandwiched it and no matter what I did, there was always some leftover. There was next to no choice but to pair them together. Sprinkle water over the rice to moisten it unless you are using rice that was just cooked. If your rice has been sitting in the refrigerator for more than a couple of days, then that little bit of water helps. Add lemon juice, stir and do a taste test for salt. Kanda lassun masala has some salt in it, so you may or may not need more salt, depending on your sodium intake. Kanda Lassun masala powder is very versatile and I get a quick ride to Bombay and back when I have anything that has been liberally spiced with it. Vada-pau is what comes to my mind! There are, of course, a myriad variations: add some green chillies or dried red chillies and/or curry leaves in the phodni, add some fresh julienned ginger, add some steamed veggies and so on. Rotisserie chicken and rice is by far the simplest and the fastest, especially for lunch when I don't have much time to spend in the kitchen or think about food. My days are very hectic and long, and they get doubly so in summer when I have a demanding 9 year old at home. No leisurely cups of tea or time to sit and plan the next meal. Lately I have been wondering why I didn't learn from the previous year and keep Medha busy at a summer camp. But, no matter how much I am looking forward to the first day of school - just 2 more weeks, yay! - I have really enjoyed having her at home. And, she's been a great help in the kitchen. She can now boil eggs, make her own breakfast as well as a simple lunch. She helps lay the table, too; although I had to stop her from using up so many paper napkins. She was very disappointed when I told her that we don't need our silverware wrapped in a napkin. But she cheered up considerably when I told her to do it to save the Earth. That works like a charm, every time! I must admit that what I was not prepared for this summer were the pre-pubertal hormones that are kicking in and the quick repartees. Especially the conversation after we had Leftover Chicken and Rice for lunch! I had to rush back to my office for a meeting, leaving me just enough time to clear up in the kitchen but not the table. Me: Medha, could you please clear and wipe the table? Her: But, Mumma, why do I have to do it? Me: Let me put it this way: I am going to remember this! Her: But...but...but, Mumma! That would be a waste of memory space! Right. No carry-forwards. No leftovers. I hope your summers are going as well as mine! Despite a persistent but mild migraine, we went on a 5.4+ mile hike to Ouzel Falls in Rocky Mountain National Park this weekend. 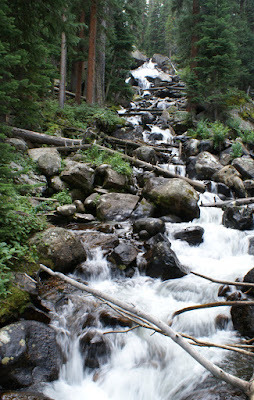 Here's a picture of Calypso Cascades that we encountered on the way. It's raw nature in your face up in the mountains. Update: I just realized that this fits in very nicely with Mallugirl's Summer Express Event. So off it goes! Medha's bowl and plate are just lovely! Very pretty colors. why no you post kanda lasun masala? why you make my mouth drip drip water? not fair. and WHY DO YOU DO THIS TO US? them jumble letters for comment putting are very evil. thats a lovely writeup Manisha! i am eager to know about the kanda lasun masala too :)! 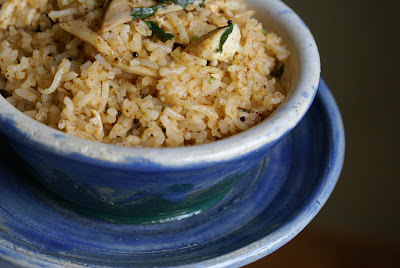 Indian spicy fried rice to the rescue! Yes, me too (the kanda-lasun masala that you use now and then)- deconstruct, if you use out of the packet. Seems to me someone in Bombay may feel as if they owe me a favour soon...I'll use that for this in return - only so that they feel better! And, since this 'exchange' has been recorded here, it can be safely deleted from short-term memory! Nupur, you spotted the star of the post right away! She is, of course, glowing from the praise. The mountains are the Front Range of the Rockies and depending on the time of the day, that green round thing is either the sun or the moon. Bee, what men?! You also got transported to Bombay or what? I buy my kanda lassun masala from the Indian grocer. 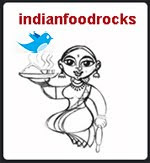 I like the Ethnic Kitchen's brand but Bedekar or KePra are also excellent. It is a long process and involves making goda masala first - you could use Anita's recipe and then take it to the next level by adding dried and then fried onions, garlic and red chillies. I might try my hand at it if we get a clear week of sunshine. Right now, I'm loving the rain and the slightly cooler days! I'll scrounge around for a recipe with exact proportions, try it out and make a post. My aunt who is my encyclopedia for these things is currently caring for her husband, who had to undergo hip surgery after a fall. Anita, pray, who might that wretched soul be? Medha is most appreciative and is wishing for more short-term memory loss for me! i made the goda masala already. and yes, medha need a special mention for her great bowl and plate. You don't like the Chinjabi connotation? Super Bee, then all you need is this. I don't know if this is how it's made in my family. Medha's latest bowl blew me away. It is great for dips and reveals itself as its contents disappear. Anita, before Chinjabi came phodnicha bhat . Took me longer to figure out Chinjabi! Duh! I never read that book either. I did see the movie. And I became a 10 year old swinging from the trees, fighting for my land and my people! I also cried. Oh Manisha this reminds me of the gorgeous biryani/pilaf type of dish my dad used to make when we had plenty of rice and roasted chicken leftover. How I miss it. Thanks for making me drool. But do not worry I am going to visit my parents soon and then I'll be putting up my dad's version to make YOU drool! Hugs! This write up is so much fun! and i love Medha's bowl! Its so pretty! And then, the bones can be dried and strung into j...just kidding! 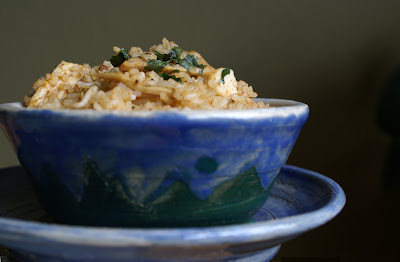 I like the fried rice idea- such a useful method of using both leftover rice and other things. It looks like Medha has an interest in ceramics- she's so good at it! Meeta, you have to make sure your Dad makes it for you! I can't wait to drool over both your pictures as well as try it out! You must! I hope you have a wonderful visit with your parents! Musical, thanks! She's rather proud of herself. She took a break from pottery this summer. She's very eager to go back. I'm looking for shelf space! Pel, that's a neat idea although I am not sure Medha will appreciate the stock as much as being allowed to chew on the bones! BTW, I recently found some free-range chicken stock that is low on sodium. Makes a wonderful French Onion Soup! Rice never goes waste in my home. A relocational astrological reading indicated that Medha will be interested in "many" things and will want to try them all out. The advice to me was to let her dabble in as much variety as she wants instead of making her pick one and stick to it. It's interesting if you believe in that sort of a thing. I don't know that I do but currently pottery does hold her interest the most! loved the indian spicy fried rice! as well as your cutlery wrapped up in paper towels. i have never tried this with the rorisseri chicken so there is a new recipe!thanks. Chicken and rice - 2 things I live for (lol). A peristent mild migraine, my sympathy, I know all about those too :( Looks like you're not letting it keep you down though, that's good. That brand of stock that comes in a box? If so, no..it's not bad at all! Generally, I make my own stocks- just so they are neutrally-seasoned; I've found that some commercial stocks have a predominate "European" seasoning that clashes with other cuisines. Well please stack them with care we don't want them raining on you for you sure. Mallugirl, buy the ready masala. It is just like homemade. Easy for you. Easy for me, also! ;-) I do want to get an authentic family recipe for this masala but it's going to take me a while. So hang in there. If you can't, look for Ethnic Kitchens, KePra or Bedekar's for good kanda lassun masala. Cynthia, my faves too! Except that these days I am trying to wean my family off white rice and onto brown rice. It's not going very well is what I can tell you! The headache persists and I think I just need to go exercise more! It seems to help. I hope yours don't linger as long as mine do! Pel, I am too lazy to go look up the brand. But it is the best I have tasted so far. And I don't think it has any seasoning. And yes, I do the crouton and melted cheese under the broiler thing. It's yum! I don't make it often because of the amount of butter that goes into it! ISG, it's the bowl and the plate! The rice was good, too. I learned my lesson the last time! No more heavy plates and bowls on the top shelf! I still have to get back to you on your last couple of comments. I'm off to do that now! Manisha I loved the bowl and plate. A kiss and a hug for Medha for making it and also helping you. At that age I simply sat reading a book while Mom yelled. Dad always let me go too. Format your disk for the sweet kid. Manisha, I bought a packet of kanda-lasun masala which I used for your Nutty Green beans (BTW, just posted it on my blog, with a link to your recipe) and was looking around for other uses of the masala. Will surely try this one soon. Nupur, thank you! Lately she has an answer for everything. Even when she's not asked a question! :-D This is such a fun age and she's great company! Glad you got to catch up with family! It always feel very good! But Bangalore has its charm, too, ya?! SJ, I saw that you put your own spin on the Nutty Green Beans. Very cool! You could leave out the phodni in this, too. I like hing which is why I find any excuse possible to use it! You can also use kanda lassun masala in Vangi Bhat and reduce the amount of fresh garlic you use. It is goda masala + other seasoning, after all! Nice use of leftovers....and conveniently made...great post!